It was appropriate that the home of 'Cheers' (the TV show) was represented by the cheers of the audience, hugely appreciative of the evening's entertainment from Nick and his merry men. Another fine performance; the band have a travelling day tomorrow, heading to Canada for a brace of shows, one in Montreal, the other in Toronto. 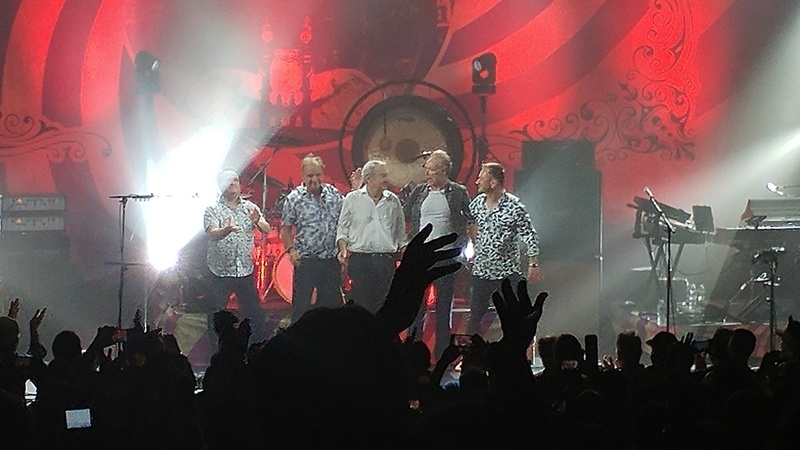 Nick Mason of Pink Floyd's return to the Bay State for the first time since 1994 with the rest of Pink Floyd was well worth the wait. When I first caught wind that Nick and his current band Saucerful of Secrets was playing New England for the first time since The Division Bell Tour, I was gung ho on going to the show. Was ready to get tickets then was sidelined with a bad cold that kept me bed bound for a while. Recently, I got better and then waited until the ticket prices dropped to get tickets for Nick and his band and this was probably one of my best concert experiences. Having seen Pink Floyd without Roger Waters in 1994 (see my review) and also Roger Waters five times (saw every tour from 1999-2012, I sat out Us and Them because of the "lip syncing" which irks me but that's just me) I was ready to see Nick again (when David Gilmour tours again I will go see him and pray I don't get the flu again which was why I missed the Rattle That Lock Tour in 2016). I arrive at the Orpheum Theater for the show and was taken aback by the venue, it is a small theater of 2,200 seater and was admiring its history of bands who played there over the years (David Gilmour played three nights at the theater in 1984 on his About Face Tour, Rush in 1978, The Police in 1979, Genesis in 1976 and 1980, Judas Priest and Iron Maiden in 1981 among many bands who played this prestigious hall). Now to see Nick Mason's Saucerful of Secrets play here was a major honor. Nick put himself together an amazing band of longtime Pink Floyd bass player Guy Pratt (a member of Floyd IMHO), guitarists Lee Harris (who was amazing) and Gary Kemp (also a great player) and keyboard player Dom Beken rounded out this amazing band. The lights dimmed and after Hans' "Why is it so terribly loud" off to the races with "Interstellar Overdrive" and they played amazing. Lee's Telecaster went silent midway into the song and quickly switched to his Stratocaster without glitch and the song was an awesome opener. Then was "Astronomy Domine" which Nick hadn't played since 1994 (brought back memories to when I saw Pink Floyd in May, 1994 at Foxboro Stadium Night #2) and the performance was amazing. Then Nick said hello and his stage bantering (along with Guy's was pure comedy gold) and Lee brought up the last time Guy and Nick were in Boston was at Foxboro Stadium in 1994 which had major cheers from the crowd (me included) and he brought up the Boston Tea Party and Guy joked "Not the original Tea Party" and some were there who followed the band much longer than I have. Next was "Lucifer Sam" to complete the early Piper trifecta. Next was "Fearless" and Gary Kemp sang it amazingly and with passion and fire and joy. With Nick's decision to stick to pre-Dark Side of the Moon era material was all I needed to go see this show and as far as I'm concerned, Nick Mason is Pink Floyd as he is the lone member of the band who was on every album. Seeing performances from Obscured by Clouds, Atom Heart Mother, More, Relics and The Early Years 1965-67 set and A Saucerful of Secrets. When Gary Kemp said that playing Boston was reminiscent of his home country and the enjoyed playing there. Nick even dedicated Arnold Layne and Vegetable Man to Syd and "Remember a Day" was for Rick Wright. Some minor glitched like Gary Kemp' guitar went dead after the gong section for "Set the Controls" but hey, it's Rock and Roll. Also Gary loved his experiences in Boston and they finished with three Syd tracks before closing with "One of These Days". Then the final goodbye. Then it was encore with Saucerful of Secrets and the last encore was "Point Me at the Sky" and a perfect way to end a magical night. The light show and music is proof that Nick Mason was the Pink Floyd link.